Limiting other users from PracticePanther features. Roles & Access levels allow you to limit other users from accessing certain features in the software. 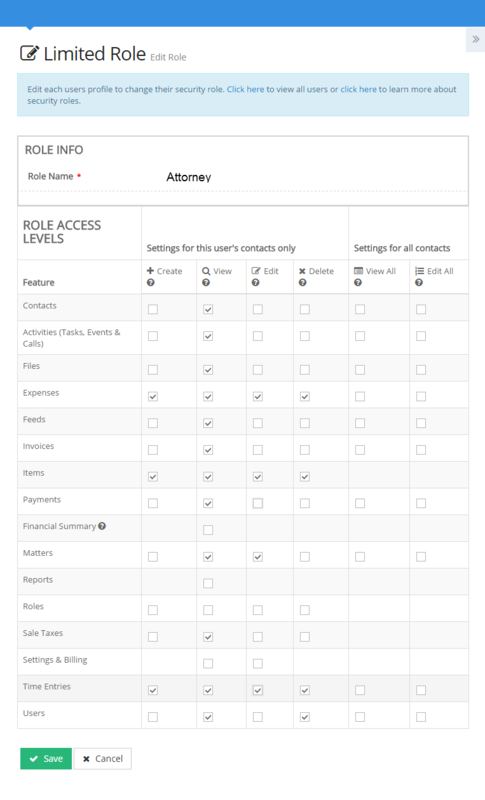 For example: You might want to limit what your paralegal can see and access in the software, like the company's financial summary in the dashboard. 1) To create new user roles, click on "More", from your dashboard, then click "Users". 2) Click on "Manage User Access & Security". 3) Add a new role by clicking "New Role". 4) Give your new Role a name and begin to check off/on options accordingly, then click "Save". 5) Edit any user you'd like to apply a new role to by hovering over the contact, and clicking on "edit". 6) Select the desired role for the contact. The new limited role will now be applied to the user you assigned it to. Certain pages will be off limits, as well as certain features, depending on how you've set up their user role. This user will not be able to delete Contacts/Matters but will be able to create time entries and expenses while he is assigned to to the contact or matter. They are only allowed to view payments, invoices, and taxes. These options will be enabled to a different user (office manager) who will have different access to generate invoices and log payments.